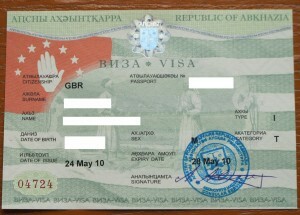 Before I arrived in Georgia, I had applied to the Abkhazian Ministry of Foreign Affairs in Sukhumi for a visa to visit Abkhazia. After a little toing-and-froing I was assured that my visa would be waiting in Sukhumi and my name would be on the “approved list” at the incoming border checkpoint. 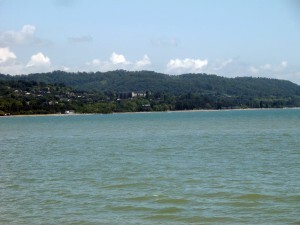 I took a taxi from Zugdidi to the Abkhazia border, arriving at around 8:50am. On the Georgian side, there was much careful writing down of my particulars (name, nationality, passport number, date of birth, place of birth) and a couple of phone calls “to officer” to get the OK. Everyone was quite friendly and it took about ten minutes. 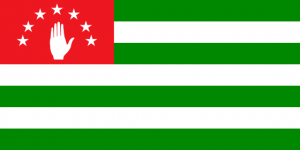 I was warned to beware of thieves on the Abkhazian side. On the way towards the border, still on the Georgian administered side, there is a strange sculpture of a giant revolver pointing towards Abkhazia, with the barrel tied off. Interpretation is left to the viewer. 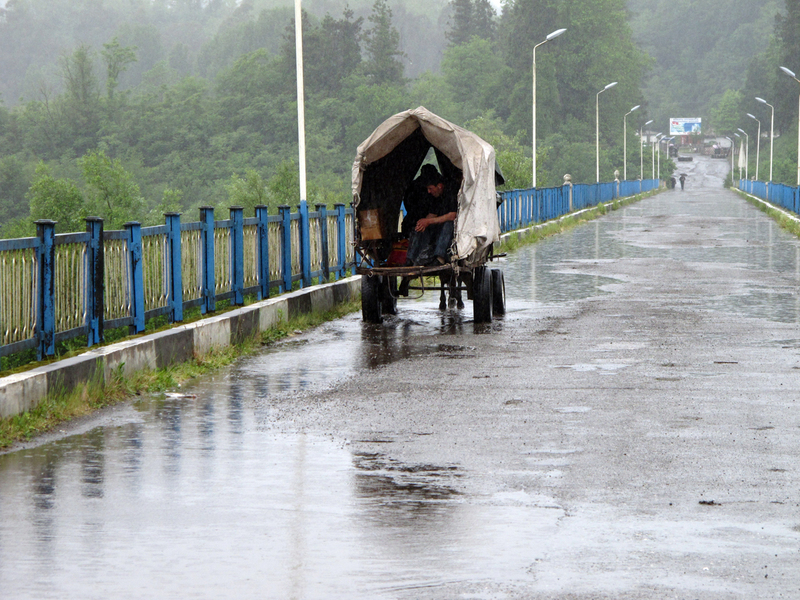 There was then a long trudge, perhaps 1.5 km, down a road and over a bridge to the Abkhazia checkpoint. Naturally the route was in dismal repair, with giant puddles. There was moderate rain. Sigh. On the Abkhazia side, with no thieves anywhere in sight, a cheerful young passport officer with no English confirmed that my name (with maybe a dozen others) was on a handwritten list on his desk. I was then waved through. It took less than 5 minutes. I was out and in the minibus for Gali around 9:30. But (perhaps due to the rain) it was a slow day and it wasn’t until around 10:30 that we had a full bus and left for Gali. We got to Gali around 11:00. After a little dithering, and the persistent assertion that there would be no bus for several hours, I agreed to pay for a taxi to Sukhumi. We zoomed off, then a few minutes later abruptly U-turned and zoomed back. It turned out the driver needed to go home to collect his license (I guess he normally doesn’t need it?). The area of Abkhazia around Gali is very decrepit. Although many buildings seemed OK, I also saw several ruined buildings, probably from the 1993 war. Much of the farmland seemed untended and growing wild. The road was very bad, and we were continually veering from side to side to avoid potholes and puddles. (The rain was now heavy.) After we reached the coast (Ochamchire) the road and countryside improved dramatically. By Sukhumi the road was fine. The driver dropped me off at the Hotel Ritsa. I dutifully hunted down the correct bank (“Сбербанк”, hidden in the Customs Yard) to pay my 641 Russian Rubles visa fee, got my payment voucher and headed off to the MFA building. While searching for the Consular office, I accidentally wander into a small theater area and hurriedly backed out again. But after some searching, I found that this really was the room being used by the Consular Section and the people on the stage with desks and PCs were the consular staff, not actors holding a rehearsal. 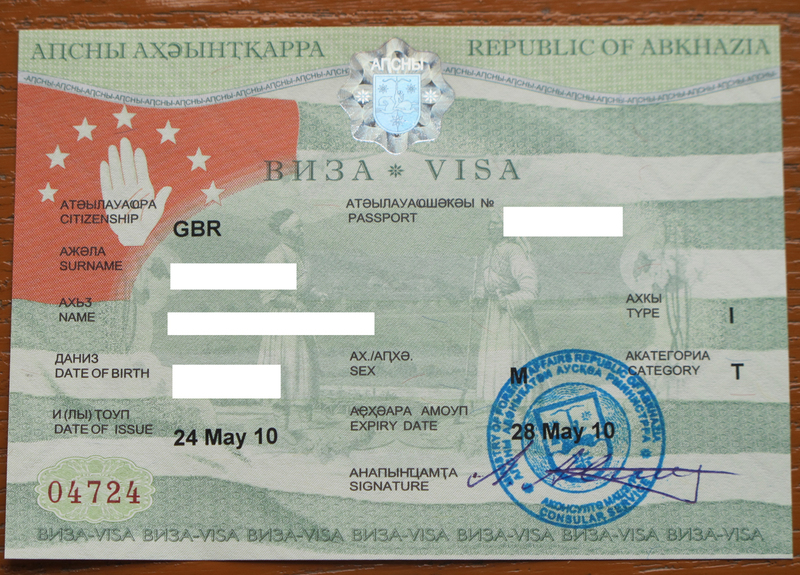 Eight minutes later, I was duly issued my Abkhazia visa. Hurrah!!! The Hotel Ritsa is trying hard to be a first rate hotel. It has been recently renovated and my room has first rate fittings, with rather erratic installation. For example, the elegant chrome toilet roll holder fell off in my hand and all the faucets were loose. But it was actually all fine and comfortable, just slightly eccentric. 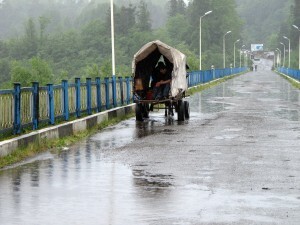 Later, I ambled around central Sukhumi in occasional drizzle. The city is a little drab, but the central areas have now (mostly) been repaired. I passed the burned out, but structurally intact, Presidential Palace. (A victim of the 1993 war.) There is a large empty plinth in front, which I suspect once held Lenin. 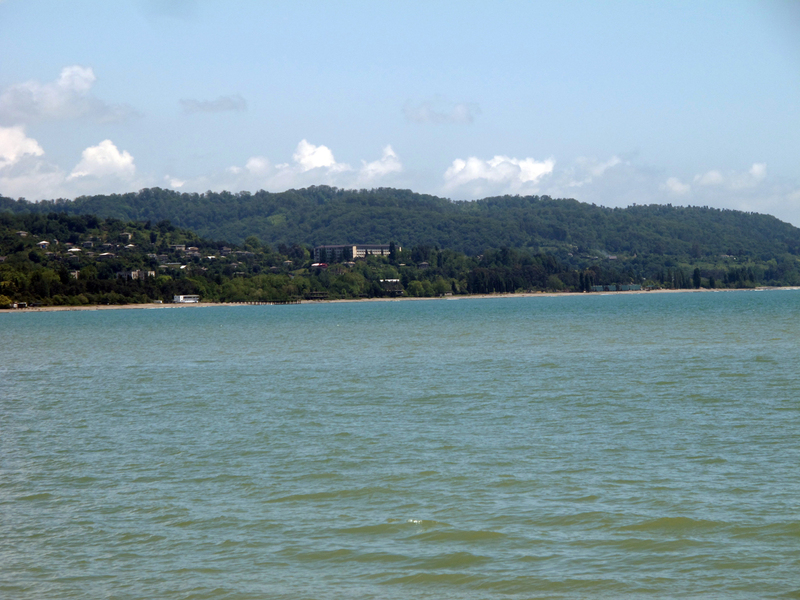 The following morning, the rain stopped and the day cleared up nicely: Sukhumi is much more fun in the sun! It is at about the same latitude as Nice after all. The Abkhazians clearly love their palm trees and their beautiful pebbly beach. I dutifully wandered through the pleasant Botanical Gardens and admired their many semi-tropical plants and also their fine water lilies.